The Virginia Peninsula is the southernmost of three peninsulas that comprise the western side of the Chesapeake Bay in Tidewater Virginia. 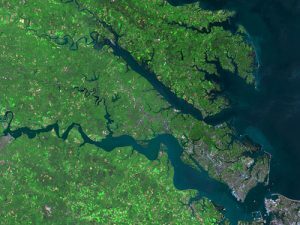 The Virginia Peninsula is bounded by three major waterways; the James River (south), York River (north) and Chesapeake Bay (east). Across the York River lies the Middle Peninsula. To the south is Hampton Roads. Several communities are located on the Peninsula, including Williamsburg, Jamestown, Yorktown, and Poquoson. Also located on the Peninsula are the cities of Newport News, and Hampton. The area known as the Historic Triangle, formed by Jamestown, Williamsburg, and Yorktown, contains many of the nation’s most treasured historic landmarks. The Virginia Peninsula is also known as the Lower Peninsula.